Hello there and thank you for stopping by today. Today is the first day of the MFT May Release Countdown. Only 5 days until the new release (yay)! Be sure to head over to the MFT Blog for full set and die reveals for the day. This release is packed full of gorgeous new products that I have SO enjoyed creating with. 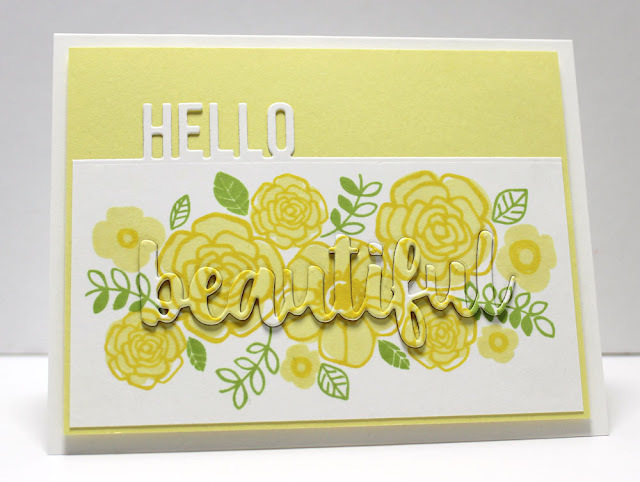 My card today features the new Pretty Posies stamp set and Hello Beautiful Die-namics. The soft yellow and green color palette with the surprise word popping out from the image is just SO fun. These products and many more will be available for purchase in just 5 days, on May 3 at 10 PM EST. Be sure to check out the MFT Blog to see what the rest of the team has come up with today. The technique with the "surprise word" is cool! Lovely card. Love how you constructed this card! Love your sentiment treatments and the beautiful color combo you chose! What an achievement, love the dimension on the sentiment! Neat how you integrades the words into the beautuful flowers- it incorporates the beauty! Very pretty card! Love the colors. Love what you did with the beautiful die!! your card is perfect for mothers day, is so beautiful! I love the way the word is camouflaged by the yellow color. I think this is my favorite! Love the card and how you used the word die!! What is that technique called? I want to try it! !